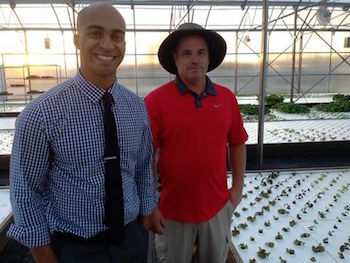 (From left to right) Chaz Shelton and Bill Shriver, co-founders of Tucson, AZ-based Merchant’s Garden, an urban farming enterprise utilizing hydroponics and aquaponics to increase access to healthy food in cities. Photo Courtesy of Merchant’s Garden. Farmers need to be good at a little bit of everything—from growing and marketing to strategic planning. Chaz Shelton of Merchant’s Garden in Tucson, Arizona, approaches farming from a slightly different angle. 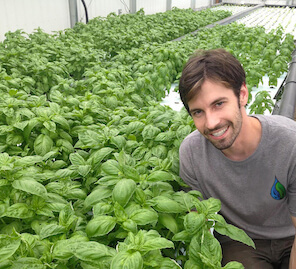 He earned his MBA at Indiana University-Bloomington and is using that broad business knowledge to manage his hydroponic and aquaponics operation with co-founder Bill Shriver. Shelton’s interest in farming began more out of an interest in public health. While working with the Philadelphia Department of Public Health in Pennsylvania several years ago, he often saw how poor eating led to adverse health outcomes. 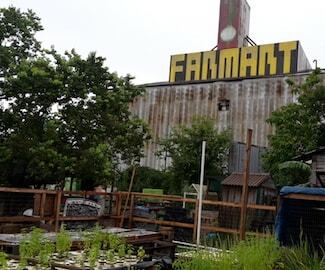 He solidified his idea that instead of shipping food from faraway farms into urban environments, he could bring farming into the city. 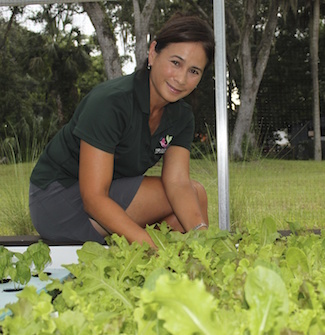 Helga Tan Fellows, founder of Ponte Vedra, Florida-based aquaponics farm Gyo Greens. Photo courtesy of Gyo Greens. 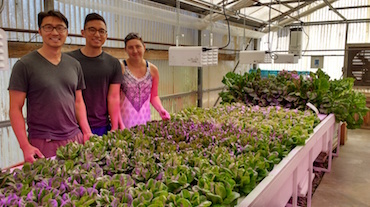 Aquaponics farms often amaze visitors with the symbiotic connection between aquaculture and hydroponics that results in picture-perfect produce. 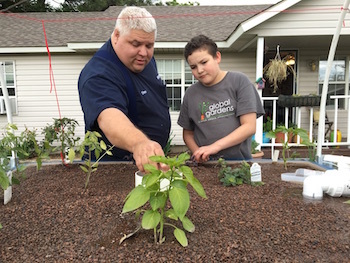 Yet many aquaponics operations focus solely on training and education. Gyo Greens in Ponte Vedra Beach, Florida, has a focus on both the business and educational realm, to further spread the message about the importance of eating locally and naturally. 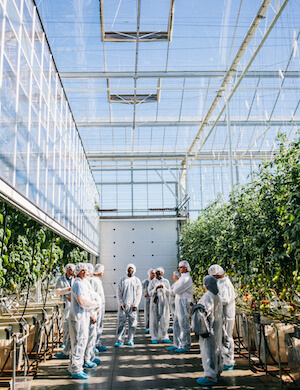 The global indoor agriculture market is expected to grow to more than $27 billion by 2020, fueled by consumer demand for fresh, local produce, a growing population, an ability to produce food in otherwise unfarmable locations, and heavy investment. But that growth is all speculation unless there are actually growers to grow the food and fill those jobs of the future. 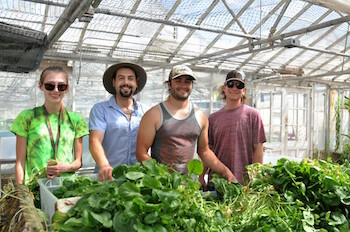 With this in mind, several universities and experienced growers have begun offering an array of programs and short courses designed to get the growing class of controlled environment farmers up and running. Bowen DornBrook, founder of Central Greens, a 15,000-square-foot urban aquaponic farming operation located on a one-acre parcel of land in the heart of Milwaukee. Photo credit: Samantha Grandlich. 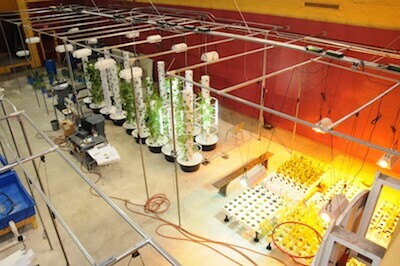 A stint with one of the most famous urban farming pioneers in the world along with a budding interest in hydroponics and aquaculture delved into while in the pursuit of a degree of in biology led Bowen DornBrook to take the plunge into aquaponic farming. In 2013, he launched Central Greens, a 15,000-square-foot urban aquaponic farming operation located on a one-acre parcel of land in the heart of Milwaukee just down the road from Miller Park, home base of the Brewers baseball franchise. In the economically depressed and food insecure City of Petersburg, VA, a former YMCA building long neglected, but not forgotten, has become a beacon of growing hope in the community. Over the past two years the building has been refurbished and transformed into a high tech indoor farm and urban agriculture research center to provide workforce development training and increase food access through the production and distribution of high quality, fresh produce to area residents.